There is growing appreciation that the success of digital health – whether digital tools, digital interventions or technology-based change strategies – is linked to the extent to which human factors are considered throughout the design, development and implementation. A shift in focus to individuals as users and consumers of digital health highlights the capacity of the field to respond to recent developments, such as the adoption of person-centred care and consumer health technologies. In an article published in the journal BMC Medicine, we argue that this project is not only incomplete, but is fundamentally ‘uncompletable’ in the face of a highly dynamic landscape of both technological and human challenges. These challenges include the effects of consumerist, technology-supported care on care delivery, the rapid growth of digital users in low-income and middle-income countries and the impacts of machine learning. Digital health research will create most value by retaining a clear focus on the role of human factors in maximising health benefit, by helping health systems to anticipate and understand the person-centred effects of technology changes and by advocating strongly for the autonomy, rights and safety of consumers. Newly published statistics show that nearly 7,000 children and adults aged under 25 in the UK have been diagnosed with type 2 diabetes. The onset of Type 2 Diabetes is strongly associated with lifestyle factors such as obesity, lack of exercise and high calorie (high sugar) diets. In recent decades, countries such as USA and UK have seen large increases in the number of people with type 2 diabetes. Most of these cases have been among older people but we are now also seeing an increasing number of cases of Type 2 Diabetes among younger people. Reversing the increase in Type 2 Diabetes is not easy. It requires action by individuals, and also by governments and societies. For individuals, it is important that people eat a healthy, balanced diet that is not too high in calories, and not high in refined carbohydrates and sugars. Dietary changes need to be combined with regular exercise to keep weight down to healthy levels, thereby reducing the risk of developing type 2 diabetes. A number of people with established type 2 diabetes have reversed their condition through measures such as dieting and exercise. This shows even if an individual has Type 2 Diabetes, they can resolve this through appropriate lifestyle measures. Measures taken by individuals need to be backed by measures targeting the entire population. This can include for example, ‘sugar taxes’ on high-calorie drinks to encourage individuals to consume them less and to encourage manufacturers to produce lower calorie version of these drinks. Calorie labelling of food can also help people make suitable choices about their diets. We also need measures to encourage physical activity, for example, making it easier and safer for people to cycle and walk rather than using cars. It’s important that regular exercise and healthy diets are introduced at a young age. Hence, nurseries, schools, colleges and universities also have an important role to play in addressing the causes of Type 2 Diabetes. In an article published in the journal JRSM Open, we discuss patient safety in developing countries. Through a review of the literature, lessons and interventions from developed countries have been taken into consideration to identify the themes needed for patient safety improvement. We provide an integrated approach based on best practice which can be used to guide the development of a national strategy for improving patient safety. Policy makers need to focus on developing a holistic and comprehensive approach to patient safety improvement that takes into account the themes discussed in this article. 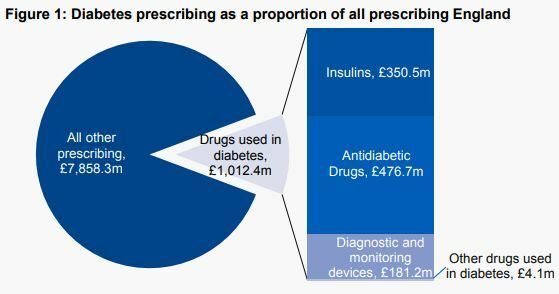 Drugs used to treat diabetes are now responsible for 11.4% of total primary care prescribing costs in England, £1,012 million annually. The very high costs to the NHS of treating diabetes are an inevitable consequence of the increase in the prevalence of type 2 diabetes in recent decades. This increase in the prevalence of type 2 diabetes is in turn a consequence of lifestyle factors such as high-calorie diets (particularly diets high in sugars and refined carbohydrates), physical inactivity and obesity. We need effective strategies at both population and individual level, and changes in the obesogenic environment we live in, to reverse these adverse lifestyle- associated factors and bring down the prevalence of type 2 diabetes. Increasing workload, a reduced percentage of the budget and workforce retention and recruitment problems challenge the capacity of available general practitioners in the UK NHS. Consequently, patients’ ability to obtain general practitioner appointments has declined. Political pressure to improve access has been accompanied by promises of increased general practitioner numbers, but with a reported fall in 2016–2017,5 it remains unclear how this will be achieved. Meanwhile, financial constraints have also led to the loss of some community-based health services, such as district nursing and fragmentation of others. In a study published in the Journal of the Royal Society of Medicine, we examined whether the systematic deployment of community health workers in the NHS could help address current problems of fragmentation and inefficiency, while improving clinical outcomes through improved uptake of appropriate services. Conservative modelling suggested that 110,585 community health workers would be needed to cover the general practice registered population in England, costing £2.22bn annually. Assuming community health workers could engage with and successfully refer 20% of eligible unscreened or unimmunised individuals, an additional 753,592 cervical cancer screenings, 365,166 breast cancer screenings and 482,924 bowel cancer screenings could be expected within respective review periods. A total of 16,398 additional children annually could receive their MMR1 at 12 months and 24,716 their MMR2 at five years of age. Community health workerss would also provide home-based health promotion and lifestyle support to patients with chronic disease. We concluded that the integration of community health workers at scale in NHS primary care could represent a timely and relatively rapidly implemented approach to the workload crisis. Chronic disease management, cancer screening and MMR immunisation uptake provide examples of potential benefits; there is a need for formal piloting to establish the impact of community health workers in NHS primary care. On Thursday 20 September 2018, our MPH students will be presenting their research projects. This will be the last assessment for the 2017-18 course. We have a wide-range of presentations on very topical issues in global health and health policy. The topic of the projects may help prospective students as they can see the kind of dissertations that our students complete. A systematic review of risk factors of knife carrying, usage, and stabbing among young people in United Kingdom. What is the evidence for the effectiveness of lung cancer awareness schemes in the UK? Risk factors associated with antibiotic resistance in inpatients with Escherichia coli infections. Prevalence and determinants of cigarette smoking relapse among US adult smokers – a longitudinal study. In an article published in the British Medical Journal, I discuss the health outcomes achieved by the NHS in the UK and how these compare with other European countries. Health outcomes in the UK have improved substantially since the NHS was established in 1948. The NHS also performs well in many international comparisons on measures such as efficiency, equity, and access. Despite these achievements, however, problems with health outcomes remain. Moreover, other European countries have also improved their health outcomes in recent decades, often at a faster rate than the UK. Consequently, the UK now lags behind many other European countries in key health outcomes in areas such as child health and cancer survival. I conclude that new health policies in the UK should help the NHS to focus on improving health outcomes and that politically expedient schemes that are not evidence-based – such as extended opening hours in primary care – should be abandoned. Continued progress is also needed on wider determinants of health such as poverty, housing, education, employment, and the environment.